Fence talk saved my flower farming life. 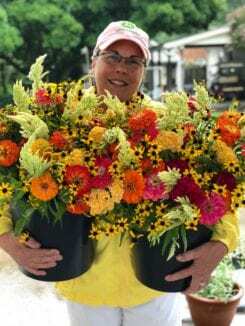 I’m heading out to deliver some of our drop off subscription bouquets. During my years as a flower farmer and business owner, I’ve learned many monumental lessons. The one I am sharing here saved my flower farming life. It occurred during my early years of farming. I was frustrated and seriously thinking of quitting. He pulled up and waited. I try to blame my next move on being overheated, but the truth is I was just so stressed…I ignored him. Finally I walked over. He stared at me and then cut his tractor off, a first. He asked, “What is wrong?” And this starts my gushing. After a long silence on his part, he began to share. Here was wisdom from a man that had built and ran not one, but two successful farms. His message was to focus on the things that really matter to the business. Do what’s important to the bottom line and let the rest go— it’s the way to success. Why be in business, be the boss, the one in charge if you don’t make money and have time for your life too? In the weeks following that bawling talk I decided to turn the tables on my business. To start being the one in charge instead of chasing the dream and never catching it. I began trimming and spent time focusing on what helped my business the most. This led my business to success and had a major impact on my quality of life. I’m now in my 20th year of flower farming and I still follow this same train of thought. I am so confident and organized in my business that time opened up for what matters to me most…my family. For several years, I have been sharing this with those eager to begin and those already flower farming. They are experiencing the same as I have— less chaos, more success, and more open time. Founder of The Gardener’s Workshop and Flower Farming School Online . Author of Vegetables Love Flowers, Cool Flowers, and The Easy Cut-Flower Garden Connect with Lisa on Facebook and Instagram ! Words of wisdom, as always….THANK YOU! I’ve read your recent posts. I was talking to my coworker last night about going on a full time mission. I have a nice place; I’m just always at work. My goal is to be totally self employed next year. Lisa this a loaded lesson – I hope one day you will have time to fill us in on the things that you let go .. and the things you still let go of.. In my mind a lot of that might be in the category of the “make nice” thinks .. as i thing the Amish say. You are such a natural homemaker – as are many of us probably – with instincts to make every nook and cranny look like Southern Living was on the way for a photo shoot – well – your place does look like that a lot of times with the little touches of baskets and pots etc.. but you know what I mean.. I am guessing it is also a matter of being willing to give up the many things we have heard you say “I don’t do that any more – whether it be weddings or a certain flower that did not produce enough to pay off – you have refined your production and services to what works and what is workable. You obviously enjoy your work and the quiet moments – and you still cook dinner – sometimes at least! You have worked out many kinks – we are the beneficiaries and we are grateful. May you keep on keeping on! Jennifer you are sweet to post- thank you!